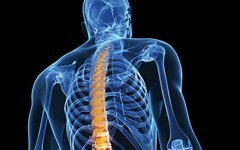 Keiser University’s College of Chiropractic Medicine recently celebrated a generous $41,000 chiropractic research fund donation at a reception and check presentation held at the university’s West Palm Beach campus. Included in the College of Chiropractic Medicine’s Cox® Technic two-day seminar, the affair emphasized the importance of the specialized form of chiropractic manipulation known as Cox Flexion Distraction. The gift was initiated from generous and committed Cox® Technic chiropractic physicians and will help to fund priority projects including a prospective study on post-surgical spinal pain, student training relating to Cox Flexion Distraction high velocity low amplitude manipulations reliability measurements of achieving specific pressures, and more. 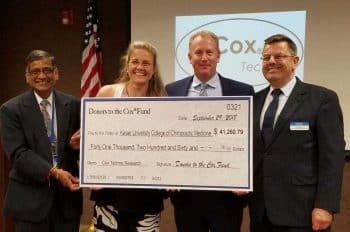 Keiser University’s Chancellor, Dr. Arthur Keiser, expressed his gratitude, “We are honored to be the recipient of this generous donation from Cox® Technic to perform research of this caliber, benefitting our students, the field of chiropractic medicine, and public health,” he said.